A New Angle on a Flossing Alternative. Ultra thin tapered brush gets between small interdental spaces to remove plaque and food particles. Angled to easily reach back teeth. Long handle is easy to grip and maneuver especially around back teeth. Antibacterial bristles help keep brush cleaner between uses. Travel case for on-the-go use. 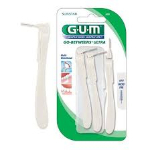 *GUM refills have bristles with a patented Chlorhexidine antibacterial coating for continuous bristle protection during the recommended life of the brush. Bacterial growth that may affect the bristles is inhibited. The Chlorhexidine in the bristles does not protect you against disease. As always rinse your interdental brush.